It's been a long, strange, and really very enjoyable roadtrip for Curiosity, our robot rover to the stars (and planets). But more than two years after it landed on Mars, and commenced rolling towards Mount Sharp, it has finally arrived — and it's started drilling. 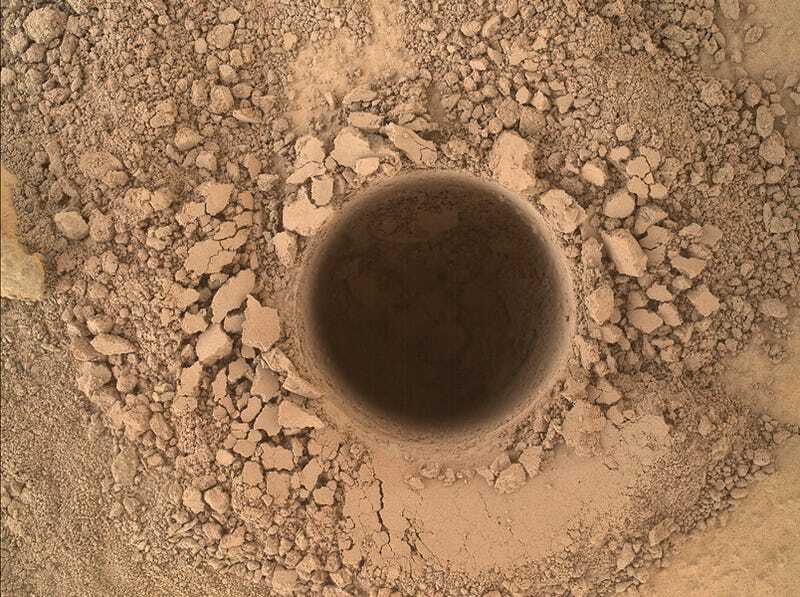 Curiosity drilled this hole, just under 2-centimeters wide, into the side of Mount Sharp. After the analysis and many others like it are finished, NASA scientists say that they'll have a much better idea of what ancient conditions (around the time that the mountain was forming) on Mars were like. To give you a sense of just how far the rover had to travel to get here, check out this map that traces its path from landing all the way to its new destination. Of course, that time hasn't been wasted. Along the way, Curiosity made stops at a number of geologically interesting midpoints, including Kimberley and Yellowknife Bay, which once hosted an ancient lakebed.